What can I say? I'm tired of the suspension going cartoony every time I run over an amoeba. This'll have to take priority over replacing the back panel (I must say I'm glad the rain's stopped for now. ). The new front shock inserts and rear shocks, now fitted. A word of warning, however. 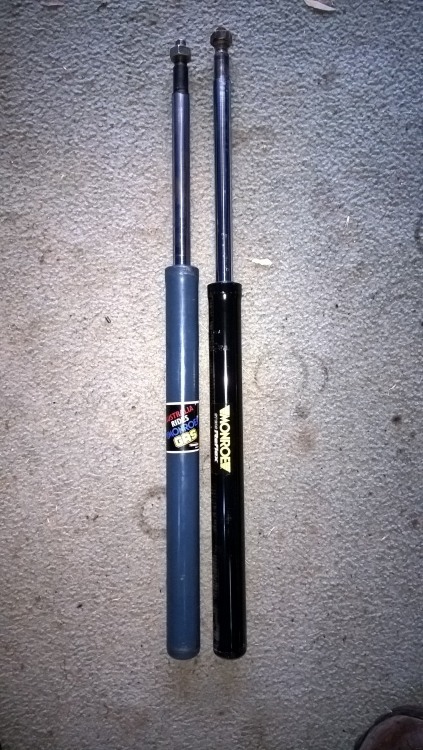 If you do go to change your struts, there are two types listed for our vehicles - one model suits up to CB2MS - 543XXX, and after that, the other part number. Here is a visual picture of why - on the left (up to 543XXX), on the right (after 543XXX). There is a 25mm difference in the housing height, so early model will not fit later model! 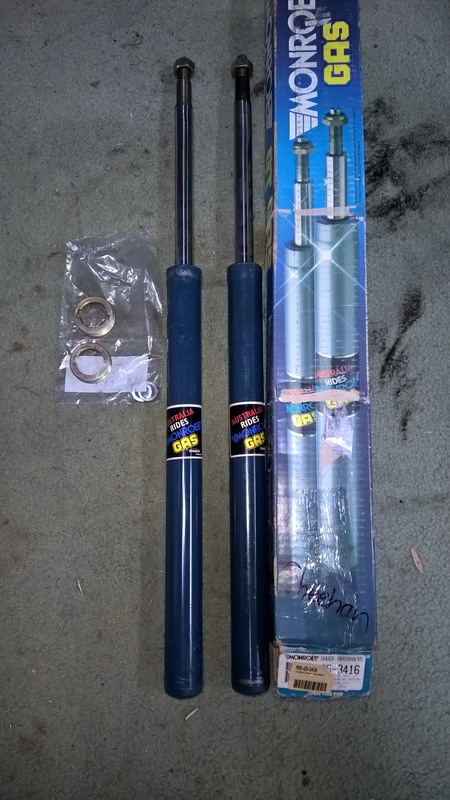 I am really glad I replaced the rear shocks, there was no rebound left in either of them! So according to my car's VIN, my car's of the after 543XXX variety. Could somebody tell me the part # for these items? Did any other car come with these parts or were these exclusive to 626's? 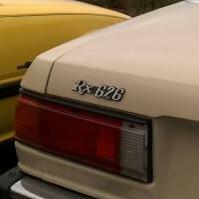 Were all 1980 models after 543XXX? Here you go, young fella! The fronts say they'll fit a 1980 B series truck but don't mention the Capella (none of the auto parts stores I asked around for showed an entry for the fronts either). The backs say they'll fit properly (post CB2MS-543880 and all). Will either of these fit m'car? Interestingly, Monroe has a different part # system for OZ and the US, which is really really annoying. KYB too. Fronts are nothing like the ones from Amazon. The difference between very early chassis code and later chassis code. Up to CB2MS- 543789 - has a longer strut insert. After CB2MS- 543880 - is slightly shorter. Yes, I can find the rear shocks no problem, but the fronts... Nobody in my backwater country seems to make them or even have a part # for them... It's exceedingly weird. Time to ply eBay for NOS! If not, I'm buying from a much more enlightened land... like Australia. I just don't want to pay loads in shipping if I don't have to.